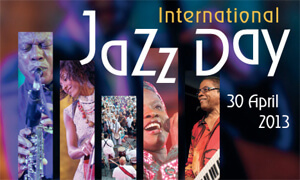 Tuesday, April 30, is the second annual International Jazz Day, organized by the United Nations Educational, Scientific and Cultural Organization and the United Nations to celebrate "the virtues of jazz as an educational tool, and a force for peace, unity, dialogue and enhanced cooperation among people." Each year, a different world city will play host to the event, while simultaneously, events will occur across the planet. This year's host city is Istanbul, Turkey. 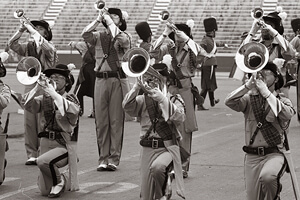 Over Drum Corps International's more than 40-year history, jazz music has long been a popular "go-to" for drum corps to perform in competition. The following clips are some of my favorite jazz moments from DCI's first decade. Those first 10 years featured some of the most popular jazz works yet put on the field. 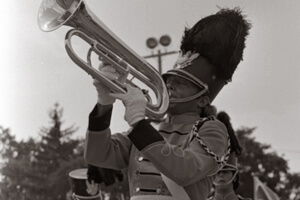 In an era prior to when corps started locking into specific themes and giving titles to their competitive productions, that decade saw most corps include at least one jazz tune during most of their seasons' repertoires, whether or not it fit into what we consider today to be an essential element of continuity. For example, during my second of three years with the Cavaliers in 1976, Quincy Jones' "Chump Change" and Maynard Ferguson's "Give it One" resided alongside Gliere's "Russian Sailor's Dance" and Stravinsky's "The Firebird." "Artistry in Rhythm" became bandleader Stan Kenton's theme song, and was also the name of the jazz pianist's first jazz orchestra, founded in 1941. Kenton wrote this gem as one of the first pieces in his "progressive jazz" repertoire. Anaheim Kingsmen performed the work two years after the corps won the first DCI World Championship, scoring less than a point from earning the corps' second title. "MacArthur Park" was penned by Jimmy Webb, who was known for such hits as "Up, Up and Away" and "By the Time I Get to Phoenix." Actor Richard Harris, whose filmography from 1959 through 2003 included "Camelot," "Gladiator" and two "Harry Potter" films, selected the piece for his successful 1967 foray into pop music. Maynard Ferguson's version from his 1971 album, "M.F. Horn," provided Scouts' standstill concert selection during their first DCI Championship-winning year. "Dark Orchid" was a real shocker for drum corps fans, coming from a corps that was best known for exploring Broadway tunes and symphonic music. Sammy Nestico, who wrote much of the material performed by the Count Basie Orchestra, composed the piece. Fans expected the corps to play pieces like "Appalachian Spring," which preceded the work; so to hear the corps play a rocking out vigorous jazz work was a jolt to the senses. "Channel One Suite," Blue Devils' opening piece in 1976 and 1977 was—at seven minutes—the single longest musical selection performed on the DCI field at the time. Bill Reddie wrote the work for the Buddy Rich Big Band, which recorded it on the "Mercy, Mercy, Mercy" album. Buddy loved the work and wouldn't allow any other drummers to play it. The drum line brilliantly converted Buddy's solo to a feature spread throughout the entire section. "Ol?©" was a track from Maynard Ferguson's "Echoes of an Era, '61/Si, Si, M.F." album. Ferguson commented that if he didn't play the work in concert, his fans would go home disappointed. Jazz trombonist Slide Hampton, who played with many top jazz bands of the '50s through '70s, wrote the piece. His performing got the most exposure when he supplied the sound for Earle Hyman's jazz trombone playing as Cliff Huxtable's father in "The Cosby Show." Horace Silver originally wrote "Nutville" for his own quintet. The tenor saxophonist and jazz pianist was renown as a bop pioneer, performer with many of the famous jazz artists and influencing force of jazz-tinged rock artists. 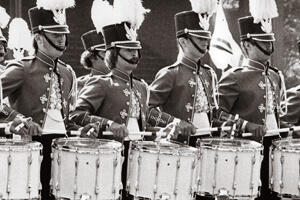 Spirit's arrangement, which helped launch the corps into 4th place, came off Buddy Rich's "Roar of '74" album, the same recording that gave drum corps "Backwoods Sideman" and "Waltz of the Mushroom Hunters." "Open Wide" was one of the pieces off "Live at Montreaux," a 1977 album by Don Ellis recorded at the famous annual jazz festival in Switzerland. It was the final album he recorded prior to his untimely death in 1978 from a heart condition. (The album also included "Niner-Two," later performed by the 27th Lancers, Blue Devils and Crossmen.) The piece has a samba-like feel to it and unlike much of Ellis' wild excursions into odd meters, is largely in a straight 4/4 time signature. "In the Stone" was a Rhythm & Blues funk single by the genre-defying band, Earth, Wind & Fire, composed by a number of the band's members. It hit the pop charts as a single and also appeared on the album, "I Am." Though not nearly as popular as the #2 Billboard Hot 100 hit, "After the Love Has Gone," from the same album, the tune seemed made for drum corps with its horn section punctuations. It became a quintessential Bridgemen tune due to its combination of funk, jazz and soul. John LaBarbera wrote "Tiger of San Pedro" for jazz trombonist Bill Watrous' band, "The Manhattan Wildlife Refuge." It was recorded in 1975 on an album the same name as the piece. The title was based on a Sherlock Holmes character from Arthur Conan Doyle's "The Adventure of Wisteria Lodge." LaBarbera was known for his trumpet playing with the 1960s Buddy Rich Orchestra, and he's written pieces for many of the most famous jazz bands of the past forty years. "Elk's Parade" typified the "old school" Garfield Cadets, prior to the corps becoming a perennial DCI powerhouse. Bobby Sherwood, better known as host of a number of 1950s television shows, wrote the piece in 1942 for his own big band. The soloist in this clip is Al Chez, was also playing jazz clubs with a still-unknown Jon Bon Jovi. After 15 years on trumpet in David Letterman's band, he left the show to focus on The Brothers of Funk Big Band, which he founded in 2008.